1. 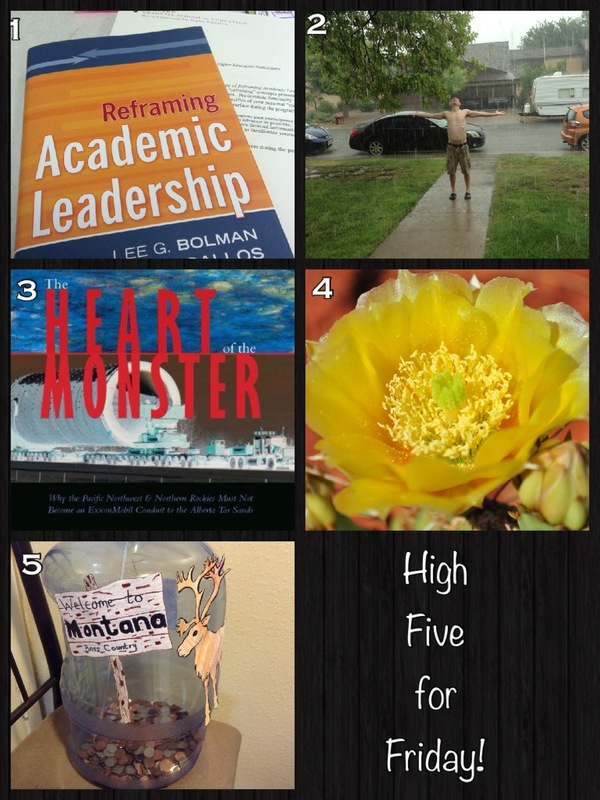 Finished reading my text for the Harvard Leadership Institute for Academic Librarians: Reframing Academic Leadership by Lee Bolman & Joan Gallos. One week from tomorrow, I’ll be at Harvard learning how I can use this book and what I learn in my library and own leadership. This book, while filled with seemingly common-sense items, helps reframe perspective through story. I like that. 2. RAIN! Living in a place that received only 7 inches of rain last year is hard – but it makes the rain that much sweeter. That’s my man-friend, Jason. Hi, Jay! 3. Last night, I finished reading The Heart of the Monster by David James Duncan & Rick Bass. My heart aches for the landscape, and this book would inspire any human to fight for their wild places. If you are unfamiliar with what Big Oil is up to in the US and Alberta, Canada – Read this. It is imperative. 4. The beautiful prickly pear in Palo Duro Canyon. I just love hiking there. Even better after all of this rain. 5. Started the lovely Montana Fund. I have always wanted to visit – mostly because of Rick Bass’ powerful prose and love of the place. Someday, soon, Montana. Someday soon. What awesome things have you done this week? Any plans for the weekend? Tell me about it!